Students must be a minimum of three years of age by August 31 to attend St. Patrick School’s half-day Pre-Kindergarten Program. The Pre-K morning schedule can be combined with Afternoon Enrichment for 5 days per week. Students must be a minimum of age three by August 31. The Kindergarten Program builds on the foundation of the Pre-K Program. While focusing on developing independent students, we transition into a more traditional setting. The classroom provides multiple activities and centers with more time spent in structured activities. Students are presented with more specific goals. 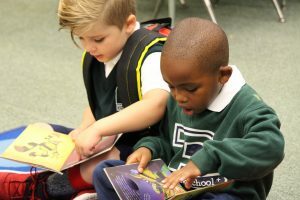 The gradual transition prepares them for a more structured classroom setting with a focus on strong reading comprehension.